Does your child go to childcare or school? Would you like to increase their understanding of allergies? Books are a great tool to introduce or reinforce information about allergies. Do you worry that your child is left out, or is seen differently by the other children? 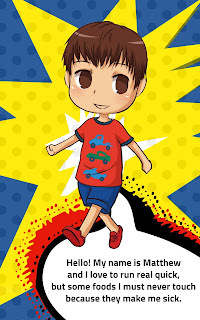 Allergy Fun helps to break down those barriers by encouraging us to think of all aspects of a person. Just like Matthew, one child might like trucks and rockets. Just like Matthew another child has food allergies. All of us have some things in common, and some things different. Today we had an opportunity to take Allergy Fun to childcare to celebrate Book Week. The children loved hearing about Matthew and his allergies. They were also super keen to share about what their favourite foods and activities were. We left a copy of the book to put on the bookshelf for kids to come back to and to use in further food allergy discussions. 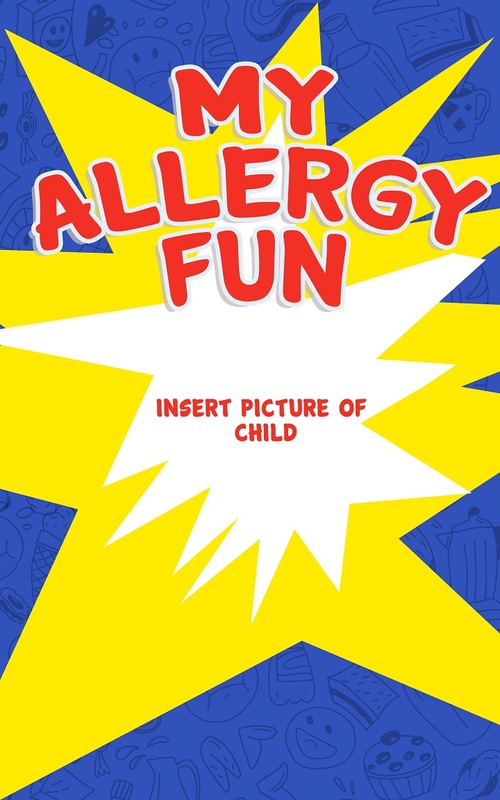 Have you brought your copy of Allergy Fun to school or kinder? To purchase your copy now, simply select your delivery option and pay online. Please select delivery option, full price is shown. 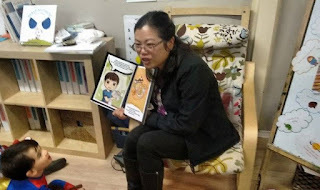 As parents, we are learning new things all the time about allergies and how to manage them. 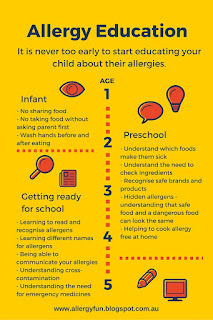 Similarly, children are also on a learning journey and we need to adjust the way we teach them about allergies as they continue to grow and mature. I was struck by the changes we have gone through in our allergy management, when our son went to Sunday School for the first time in three years. Our son is at risk of anaphylaxis to milk, eggs and all nuts. He is unable to eat any of these foods and we continue to avoid even the possibility of traces in most foods. However, at age 3, when he (occasionally) went to Sunday School, we had a long list of things to organise and discuss. Part of the reason his attendance was so occasional was that the effort required and the stress it caused probably outweighed the benefit. - Medical Information - Updated action plans for his anaphylaxis and asthma are always provided. - Medicine - Emergency Epipen, antihistimine and ventolin are always left in the room with our son. 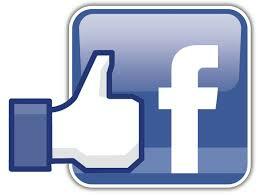 - We make sure we chat to the staff and volunteers, so they know MATTHEW has ENTERED THEIR CARE!!!! - Food - we provide all our own snacks and water bottle. No Food allowed - sticker placed on him. - No food crafts, without clarification from us. 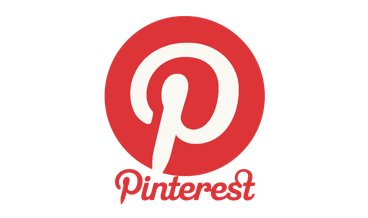 - providing a special place mat for him to eat from, and to do craft on. - sitting separately from other children during meals and even some craft time. Why are we more relaxed now? The main reason I think is that our son has been attending school now for a year and half. Although we went through many procedures at school, I am sure that the kids do not honestly wash their hands as often nor as well as they should. I am sure cross contamination occurs in many instances in the class room. However, our son has not had a serious reaction so far... touch wood! 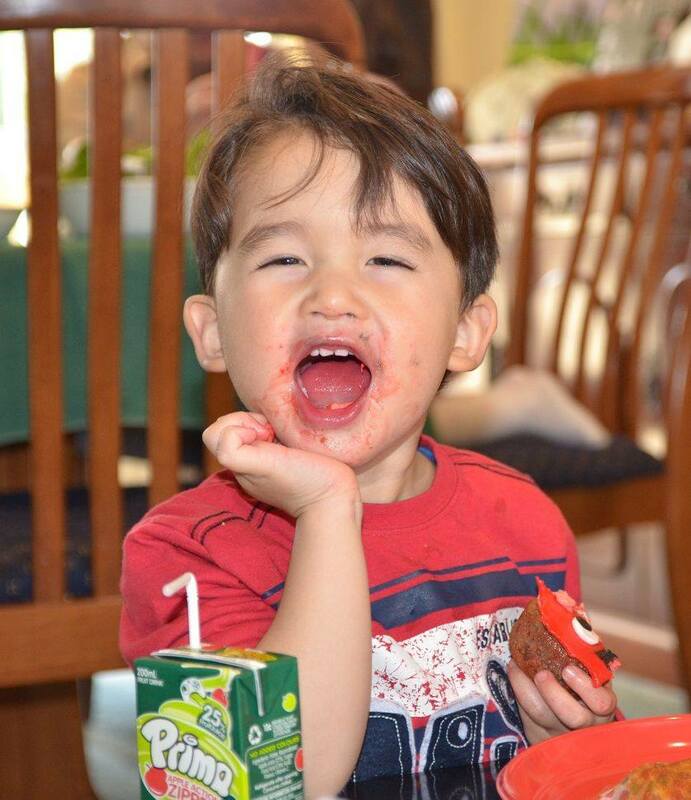 I guess this experience means that for us now, it seems our son needs to eat the allergen before he reacts. This was not the case when he was younger. And so, we have entered a stage in his life where the implements he uses and the surfaces he touches do not need to be as squeaky clean. Our son has also developed significantly in his understanding of allergies, and the children at this age are not nearly as messy as they were at 3. Phew, what a relief! Saying all that, I still stayed in the room for the whole session, to get a good idea of what goes on and what the helpers are like. I am enormously happy to conclude that my son is able to stay at Sunday School from now on, without my presence. They have all my contact details for emergencies, they have trained volunteers (quite a few), and I feel the risks are minimised and managed. What a difference a few years make! I wonder what life will be like at 9? When was the last time you reassessed your risk management strategies around allergies? I know that we tend to stick with what has worked in the past, but perhaps sometimes, it is good to reassess. You might be pleasantly surprised. 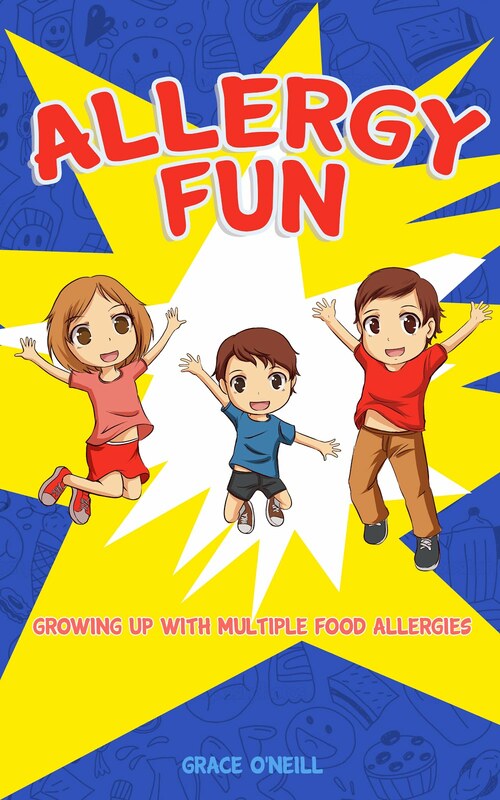 Allergy Fun can be a very easy book for young children to read. However, it is also meant as a launching platform for more meaningful and personal discussion. The level of discussion will depend a lot on the age of your child and their level of understanding. Here are some discussion points that can be raised as you read the book Allergy Fun. - Is there anything that makes you sick? - How do you know you are sick? What does that feel like? Teaching children how to understand their body is helpful so that they are able to tell you if and when they are having an allergic reaction. Explain that if their leg is sore from a splinter, they can feel that it hurts on their foot. It is important to work out why it is sore, so that we can help them feel better again. - Explain how the body can feel sick in different ways - rashes, itchiness, cramps, dizziness, tiredness, feeling like they need to vomit (nausea), feeling like they have no energy (lethargy), headache, tingling. - What makes other people sick? This can include naming other people they know with allergies, or simply explaining that we all can get sick at different times, and that it is important to first try and prevent sickness, and second, if we do get sick, how to get help and get better. - What do you like doing? What is your favourite activity? What are other people's favourite activities? Please don't raise all these points in the one sitting, or the poor child may not want to read the rest of the book! Instead, raise a couple of these points each time you read the book. Each reading will add new levels of learning. Don't forget to allow time for your child to think about things and ask questions too. Some of their questions might come at a later time, but rest assured, they are taking in every word that comes out of your mouth. If your child comes up with an interesting take on things, please do let us know. 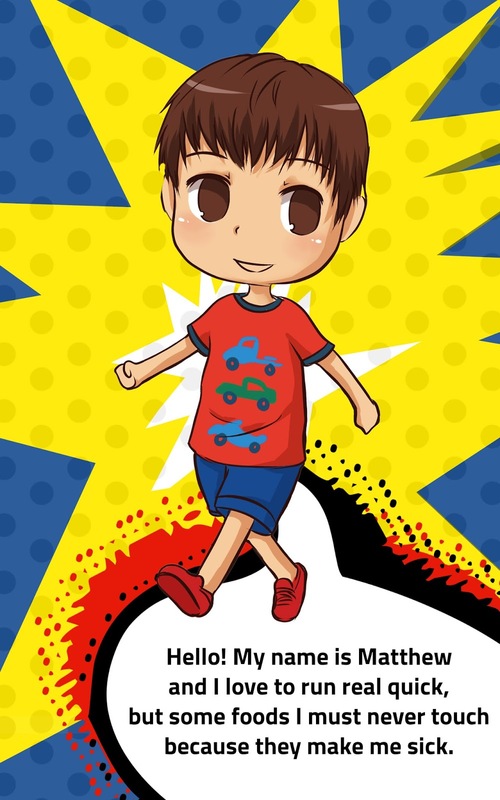 We will continue to post more ideas for how to use Allergy Fun as an effective tool for educating young children about their allergies, so make sure you subscribe and get each update. If you are new to the world of food allergies, the thought of having a party that does not contain the allergens of concern can be the cause of many a headache, and many a sleepless nights. No matter which way you choose, the more safe foods there are, the higher the chance that your child won't have an allergic reaction from cross contamination or just kids being kids. Here is a quick list of easy to do party food that will hopefully take off some of the pressure. Please check the labels on all packets before you buy, to make sure they are suitable for you. Coles Spring Rolls -found in the freezer section. They do contain wheat and maybe soy. Fruit poppers/bottles - I prefer this at a party since the chance of spilling is slightly minimised. Prepackaged Coles ham - comes in small packets, sold near the bacon. If you have other products that you use, please add them in the comments section for others to read. Just remember we are here to celebrate the child, not the food... Happy partying! Click HERE for an easy cake recipe.